Fig. 3 The three types of hp telomeres in B. burgdorferi. A representative of each type is shown and the conserved sequence boxes are shaded and numbered. Positions with known sequence variability within box 1 or near the hp turnaround are indicated in lower case. The arrows indicate the position of cleavage by ResT. This is not yet determined for the type 3 telomere, so the expected position of cleavage is indicated with a "?" mark. Adapted from Chaconas (2005) with permission from Blackwell Publishing seen with the isolated C-terminal domain (Tourand and Chaconas 2007; Jayaram 2007). Another feature highlighted by the alignment of the known hp telomeres is the existence of two types of hp telomere that differ by the spacing of the box 1 sequence relative to the symmetry axis and to boxes 3-5. A third telomere type without any discernable box 1 has been described (Huang et al. 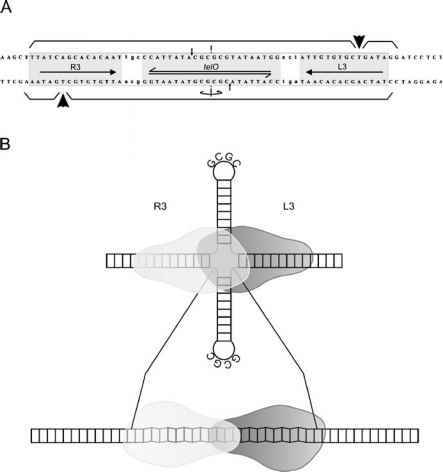 2004b) and is designated as a type 3 telomere (see Fig. 3 for a summary of the telomere types). The existence of multiple telomere types raises the possibility that there may be a requirement for more than one telomere resolving activity. Types 1 and 2 and many different substrates in which the disposition of box 1 relative to boxes 3-5 and the symmetry axis were constructed and assayed for resolution by ResT in vitro. ResT was found to efficiently process only the type 1 and type 2 spacing variants (Tourand et al. 2003). This result presented somewhat of a conundrum since in the type 1 rTel the scissile phosphates lay within box 1, while for the type 2 substrate the position of the cleavage sites would have to move from being 6 to 12 bp apart if box 1 sequences defined the position of cleavage (see Fig. 3). The position of the cleavage sites in the type 2 and a further poorly resolved spacing variant map to 6 bp apart around the symmetry axis of the rTel, indicating that site-specific binding of ResT to boxes 3-5, whose position relative to the symmetry axis remains fixed, positions the active sites for catalysis. Nonetheless, replacement of box 1 sequences in either the type 1 or type 2 substrates leads to a defect of activity in vitro. Mutation of the same sequence, which occurs in the otherwise unrelated sequence of the substrate for the N15 resolvase, TelN, also results in defective resolution; this indicates that the box 1 sequence is important for resolution in both systems (Deneke et al. 2002). Nevertheless, a type 3 rTel is also resolved in vitro, indicating that mutation of the telomere to the particular sequence found at the corresponding box 1 position is tolerated (Tourand et al. 2006). It may prove to be the case that any sequence around the cleavage site with the appropriate helical parameters for cross-axis complex formation and DNA hairpin formation (see Sect. 5.7) may be tolerated and that box 1 sequences are conserved at some telomeres as part of a promoter element (Chaconas 2005). Clearly, more hp telomeres must be sequenced and the role of the box 1 sequences given further study.